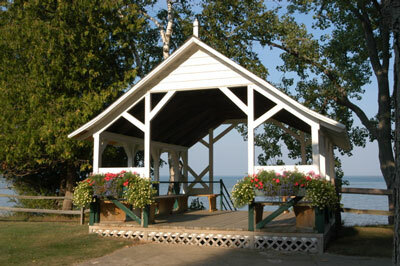 Pointe aux Barques is a century old private family community of 66 cottages just east of Port Austin.. It occupies over 900 acres of property located at the “tip of the thumb” in Huron County Michigan. Amenities include a nine-hole golf course with eighteen tees, three tennis courts, clubhouse, barn and maintenance buildings, woods and shoreline on Lake Huron. Residents of PAB treasure the family focus of the community and the natural beauty of the setting. A visit to scenic Pointe aux Barques is like stepping back in time. Here you will find the charm of “Old Michigan”, a place where there are no traffic lights, no high-rise buildings and no malls and many of the cottages dating back to the turn of the century. It is a rare place where you can enjoy a round of golf on one of the state’s oldest courses, where visitors share local cuisine with friends and family in a newly modernized century old dining facility and gather at night for bonfires on the beach. There are miles of trails through pristine woodlands for hiking, jogging or horseback riding. The beautiful clear waters of “Alaska Bay” are filled with sailboats, kayaks and water skiers during the summer months. And our miles of private beach and multiple private coves are heaven for swimmers, sunbathers and picnickers. There are few places that offer the range of facilities and natural beauty in such a private and uncrowded setting.